There is something magic about love at Christmas that encourages new friendships, sweet affection, and mutual adoration. For December I thought it would be fun to focus on some of the more romantic symbols of Christmas. The lowly mistletoe, a symbol of peace and joy, has brought giggles from girls, kisses from boys and all around good fun for all. The Norsemen tell a tale about Frigga the goddess of love. She worked to protect her son Balder from death. In her haste to bring together all the elements of earth to protect him she failed to include the mistletoe. Loki, the god of evil used the mistletoe to destroy Balder’s life. Broken-hearted, Frigga cried for her son. Her tears healed him as they turned into the pearly white berries of the mistletoe plant, raising the greenery to a plant of love that conquered death. From that day on anyone who stood under the mistletoe received a kiss and found protection from evil. Years later in the eighteenth-century, the simple green plant was hung in doorways and proclaimed the kissing ball. A young lady might stand under the beribboned symbol of love and wait for her young man to give her a kiss and promise of marriage. Sometimes they just shared a friendly kiss and went on their way. If the girl was not kissed she had to wait another year for a proposal. Folks still hang mistletoe around the holidays. 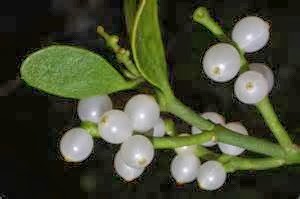 Whether there is magic in the green leaves and white berries or if it encourages a man and woman to get to know each other, the mistletoe adds fun to the Christmas season. Do you remember a kiss under the mistletoe? Did it lead to marriage?